I am a student attending California State University, Channel Islands, and I am double majoring in Political Science and Performing Arts with an emphasis in Dance. Now, these are two totally different majors so let me explain myself. I have Cerebral Palsy and use a power wheelchair. When I was about 9 years old, my mom got a call from a professional dancer and she explained how she wanted to create a dance piece with somebody in a wheelchair. I ended up doing the piece with her and ever since then, I have loved dance and it is my passion! This type of dance is called integrated dance, which includes people with and without disabilities. Throughout my dance career so far, I have performed in different talent shows, schools, Disneyland, competitions, fundraisers, art programs and in Washington D.C at the Department of Education. Through performing, I have received a lot of feedback from people about how the dance opened their minds or changed their perceptions, and made them realize that somebody who uses a wheelchair can dance. With all of the positive feedback, it made me want to promote equality and create some much needed social change for people with disabilities through my dance and my art form. The reason I chose Political Science as a second major is so I can educate myself on laws, the processes and different legislation. That way, I could become the best advocate possible. 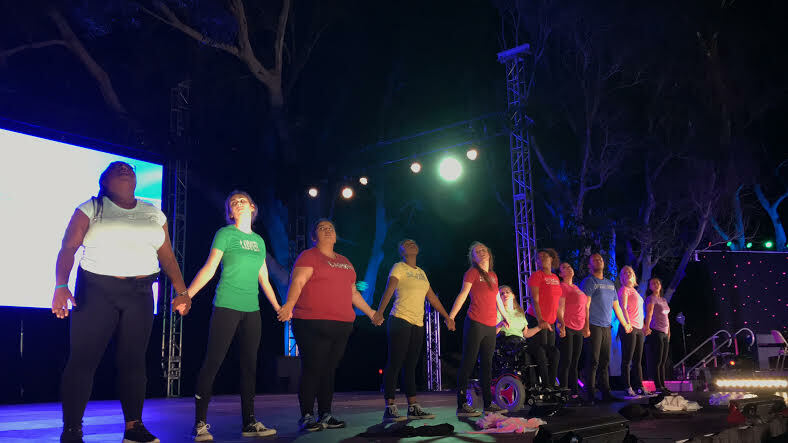 This last semester, I had the privilege to be able to research and choreograph a piece in Arts Under The Stars at California State University, Channel Islands. Arts Under The Stars is a show that the Performing Arts Department puts on every spring. It is a research-based show. The department takes different research proposals from departments from all over the campus, including departments such as political science, nursing, and so many more. Then, the performing arts program takes that research and creates a piece from it. Also, every year, the show has a theme and this year, the theme was “Empathy”. My dance professor, Heather Castillo started Arts Under The Stars years ago where the students had a dance show on the grass. Professor Castillo made a decision to make it multi-disciplinary that included different research from all departments. It has been growing every year and has now become one of the biggest events at the school with different stages for dance, live music, and other art. This semester, I decided to take an independent research class with Professor Itkonen to educate myself on subjects of case law and social construction so I can include it in my research on the history and evolution of people with disabilities. My research was accepted into the show and I was able to choreograph a piece that showed the past, present, and where we want to be in the future. I learned how much inequality there really is through case laws and other material. For example, even though IDEA (Individuals with Disabilities Education Act) exists, there are still many obstacles people have to go through in order to just get an education. There were many cases I read of parents having to fight for support for their children in school. I can relate to this, as I had to do this through my years in school. Near the beginning of the semester, I learned about IDEA, Americans with Disabilities Act (ADA), and Section 504 of The Rehabilitation Act of 1973. Section 504 is a law that prohibits discrimination against people with disabilities when it comes to programs that receive federal financial assistance. This law did not exist until 1973, which was about ten years after the civil rights movement and was the first real civil rights law to help benefit individuals. This means that when The Civil Rights Act of 1964 was passed, it bypassed people with disabilities. After Section 504 of The Rehabilitation Act of 1973 it wasn’t until the Americans with Disabilities Act in 1990, that another huge jump in civil rights was made for individuals with disabilities. The law states that it prohibits discrimination based on a person’s disability when it comes to employment, public accommodations, transportation, commercial facilities, State and local government, and telecommunications. Those laws helped me create a timeline for my piece. With social construction, there are people who have a high level of political power and a positive public image. Different people stand in different places on that scale. They might have high levels of political power with a negative public image, etc. As of now, individuals with disabilities are down on the scale of social construction and a big reason for that is society itself. Through time, society has ignored, isolated, abused and put people into institutions, and left them marginalized. Throughout this semester in my independent research class, I realized just how much society and their attitudes had to do with people who are differently-abled not being equal. In my piece, half of the people represented people with disabilities and the other half represented society. Society wore black shirts with labels on it such as ‘ignorant’, ‘intolerant’ or ‘apathetic’. The other half had on a white shirt representing people with disabilities with labels like ‘lonely’, ‘frustrated’ or ‘cripple’. In the beginning of the piece, society put ties around a person’s mouth to represent shutting people out of society and taking away their voice. It was represented that individuals were in institutions. Some people were tied to beds and chairs while others were trying to reach out to society. But society was just going through their daily lives and shutting them out. After that, the 1970s and 1980s, were being represented by having people’s voices starting to be heard. There were some people from society who started to listen. Since Section 504 of the Rehabilitation Act of 1973 came out in the 1970s and people did start fighting for their rights, I wanted to start making a transition there. We then went into the present and started that part of the performance where the ADA was passed in 1990. More voices started to be heard and more of society started to listen. This is also the time in the piece where I was transferred into my power wheelchair. I wanted to be in a manual wheelchair in the beginning because technology is something else that has evolved to help people gain their freedom and independence, so that was a big moment that represented the present so I could have my freedom. Then, there was the future. By then, the original black and white shirts with negative labels on them were replaced by individual colored shirts with positive words on them, like ‘equal’, ‘free’, ‘accepting’, and ‘inclusive’. This represents a society of equality, and inclusiveness. We were dancing together and supporting one another, showing that’s what the future needs to look like. The music in the background was Pink’s song “Wild Hearts Can’t Be Broken”. The past was the instrumental version that Professor Itkonen provided a beautiful, raw and emotional singing/narrative for. Then, the present and future was Pink singing “Wild Hearts Can’t Be Broken”. I also had a background video with facts and pictures that were from the time period we were dancing to throughout the entire piece. It was great being able to share the piece in Arts Under The Stars after working so hard on it all semester. A lot of the comments I got from people after the performance, were that they had no idea how badly treated and how much inequality there really was and how much is still here today for people with disabilities. It is the biggest minority group in the world yet one of the least talked about. The independent research class gave me a lot of insight I never had before, with both the history and present. I am so grateful I took the class because it helped make the piece that much better and I wanted to make sure I wasn’t just creating the piece without some important knowledge on the subject. Through the independent research class, the piece did a great job of portraying to the community the struggle that is still going on today and fit with the Arts Under The Stars theme of “Empathy”! Jessica Clay attends California State University, Channel Islands, double majoring in performing arts and political science. She has Cerebral Palsy and uses a power wheelchair. She does integrated dance, which includes people with and without disabilities. Her goal with both of her majors is to promote equality and create social change for individuals with disabilities. Jessica wants to do this through her dance and art form.